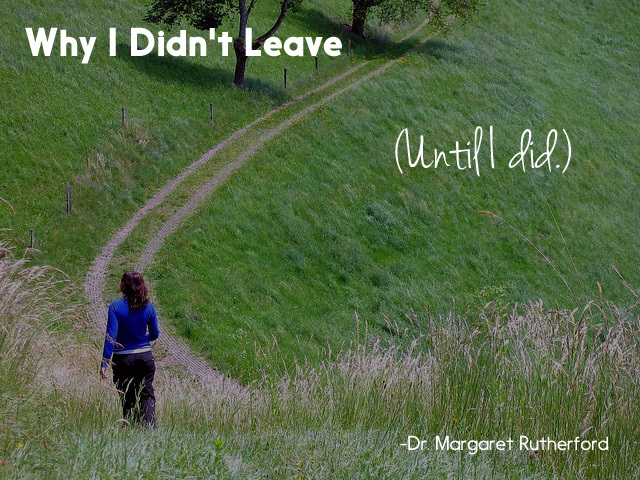 Why I Didn’t Leave. Until I Did. The discussion of why women don’t leave. There has been excellent conversation noting the complexity and reality of the danger an abused woman faces. The impact of the emotional abuse and isolation she has likely suffered for months or years prior to that. The idea that the question should switch to, “Why do men feel that they can hit women?“, brought up by activist Beverly Goodens of Twitter #whyIstayed fame. I heard one comment that I resented. I got that it was the typical onslaught. You couldn’t turn on any channel that somebody or other wasn’t talking about domestic violence. It was a lot. But if the commissioner of the NFL had been sent a video of a football player robbing a bank, would he have payed attention? I resented it because I have lived it. I know what it is like to be the woman who is keeping her mouth shut. Making others feel like all is going well in a relationship when it is not. I know after I was hit, when I continued the relationship, when I didn’t stop seeing him, I blamed myself. I thought I had made it happen. I absorbed that guilt like a sponge. I struggled for years to find my worth while being in a relationship that was highly chaotic, dramatic and critical. I stayed trying to gain trust and respect. I never could. I made mistakes. But I tried. The acknowledgement of my imperfection was the tool that was manipulated to control me. The attempt was to grind into me just how imperfect I was. It was hard to get out. And that it was okay to be imperfect. Everybody is imperfect. My life was not in physical danger like so many women. Not anything like that. I don’t want to portray that it was. All of that has been over quite a long time. You never forget what it feels like to be her. So yes. The discussion is important. As long as it is still happening. It will always be important. If you enjoyed this post, please send it on! Especially if you know of someone who may be struggling like I was. As always thank you for reading. SUBSCRIBE and receive a free copy of my new eBook “Seven Commandments of Good Therapy”, a basic guide of evaluating the therapy you are receiving or how to choose a potential therapist. You can do that by placing your email address in the gray box above. You can send private messages to askdrmargaret@146.66.99.73.